How much is Emeril Lagasse Worth? Emeril Lagasse Net Worth: Emeril Lagasse is an American celebrity chef, restaurateur, television personality and cookbook author who has a net worth of $70 million. Emeril Lagasse was born October 15, 1959 in Fall River, Massachusetts. After high school graduation, Lagasse was offered a full scholarship to the New England Conservatory of Music, but decided to pursue a career as a professional chef instead. He spent the next year training at Johnson and Wales University in Providence, Rhode Island. In order to pay his tuition, Lagasse took a job at a local restaurant where he met fellow student Elizabeth Kief. The two married in October 1978, a few months after Lagasse completed his course work. Lagasse polished his skills in Paris and Lyon, France before returning to the United States, where he spent the next few years working in fine restaurants throughout the Northeast. In 1982, Lagasse replaced Paul Prudhomme as executive chef of the famed New Orleans restaurant Commander's Palace. This demanding position, which required Lagasse to work 18 hours a day, put a strain on his marriage. Lagasse and his wife divorced in 1986, at which time Elizabeth and their two children moved back to Massachusetts. After seven and a half years at Commander's Palace, Lagasse finally opened his first restaurant, Emeril's, in 1990. Located in New Orleans' underdeveloped Warehouse District, the menu fused elements of French, Spanish, Caribbean, Asian and Lagasse's native Portuguese cuisine. 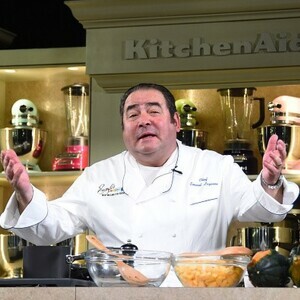 Immediately well-received by patrons and critics, Lagasse went on to open other restaurants, publish cookbooks and host several television shows. His catch phrases "Bam!" and "Kick it up a notch!" have been his trademark. 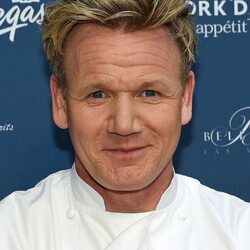 His personal cooking style and flair for the dramatic are also his signature.